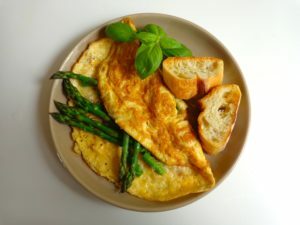 This is a great omelet in springtime when asparagus comes into season. Served with a salad alongside, it makes a perfect lunch dish. For best results, use free-range or organic eggs, and the freshest green asparagus you can find. The amount of asparagus depends on the thickness of the spears — if thin use more spears per omelet and vice versa. As for the parmesan, buy a chunk and grate it yourself. This is essential! Store-bought grated parmesan has little or no flavor. The quantities below are for one omelet. If cooking for two, you can double the ingredients and make one large omelet. For three or more, multiply by the number of people and make separate omelets one after the other. Serve them straight out of the pan. Transfer to a cutting board. Chop into two different sizes — the heads into 3-inch (7.5-cm) pieces and the bottoms into pieces about 1 inch (2.5) cm long. Grate the parmesan using the small holes on your grater — not the tiny holes. Crack the eggs into a small bowl. Add the water. Wisk vigorously with a fork or wire whip until well blended. Heat the butter and olive oil to sizzling in an omelet pan. Swirl around to coat the sides about halfway up. Add the eggs and swirl again. As the eggs start to set, lift the edges gently with a wooden spatula to let the the runny eggs on top slide beneath. This will give your omelet texture. Before the eggs have set completely, add the smaller chopped asparagus pieces. Sprinkle the parmesan over the omelet and season with salt and pepper. Allow the omelet to brown for about a minute after it’s fully set. Then slip it onto a plate, flipping it over itself to fold it in half. Gently lift the top to insert the longer asparagus pieces. Serve piping hot. Serves 1.